LOS ANGELES (AP) — The protesters whose tents line the lawn of Los Angeles City Hall made it clear that they received the eviction notice issued by Mayor Antonio Villaraigosa. Whether they'll heed it is much less certain. With hours left before the Monday at 12:01 a.m. deadline the mayor and the police chief gave for Occupy LA, very few of the occupiers were packing, and many were instead were making plans for what to do when they stay. Some handed out signs Saturday mocked up to look like the city's notices to vacate, advertising a Monday morning "eviction block party." Dozens attended a teach-in on resistance tactics, including how stay safe in the face of rubber bullets, tear gas canisters and pepper spray. Police gave few specifics about what tactics they would use if protesters ignored the deadline. Chief Charlie Beck said at Friday's news conference that officers would definitely not be sweeping through the camp and arresting everyone just after midnight. In an interview with the Los Angeles Times published Sunday, Beck said that despite the lack of confrontations in the camp's two-month run, he's realistic about what might happen. But he added, "We certainly will not be the first ones to apply force." 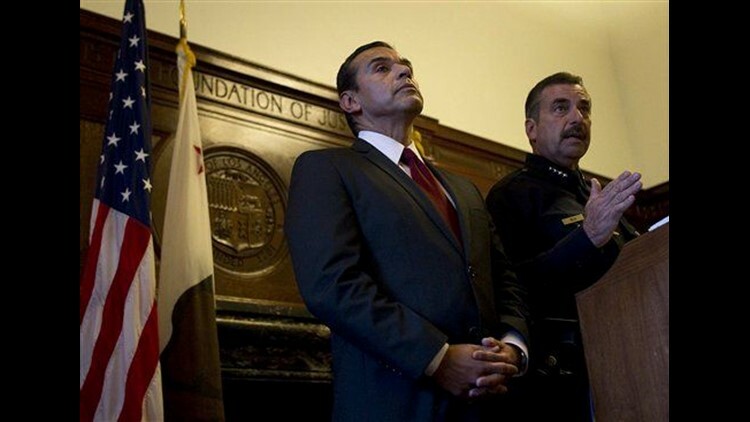 Villaraigosa announced Friday that despite his sympathy for the protesters' cause, it was time for the camp of nearly 500 tents to leave for the sake of public health and safety. The mayor said the movement is at a "crossroads," and it must "move from holding a particular patch of park to spreading the message of economic justice." But occupiers showed no signs of giving up the patch of park too easily. Will Picard, who sat Saturday in a tent amid his artwork with a "notice of eviction" sign posted outside, said the main organizers and most occupiers he knows intend to stay. "Their plan is to resist the closure of this encampment and if that means getting arrested so be it," Picard said. "I think they just want to make the police tear it down rather than tear it down themselves." But some agreed with the mayor that the protest had run its course. "I'm going," said Luke Hagerman, who sat looking sad and resigned in the tent he's stayed in for a month. "I wish we could have got more done." Villaraigosa expressed pride that Los Angeles has lacked the tension, confrontation and violence seen at similar protests in other cities. But that peace was likely to get its biggest test on Monday. Ue Daniels, 21, said as an artist he's "as nonviolent as they come" but he planned on resisting removal any way he could. "I think we'll comply as far as putting our tents on the sidewalk maybe, that's something that's been going around." But as far as leaving altogether? "They would probably have to drag me away," he said.